Researcher on the streets of NY challenges passersby to tell the difference between Communist Manifesto and Democat Party platform. They can’t! 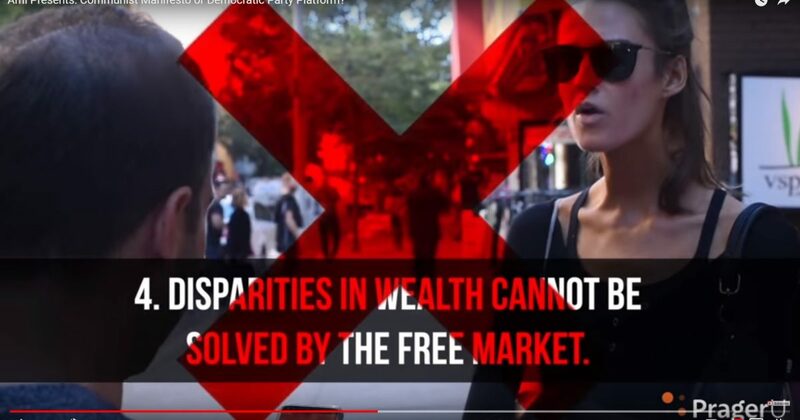 Watch as Ami Horowitz asks passersby on the Streets of New York City if certain doctrinal beliefs come from the Communist Manifesto or the Democrat Party platform. Most are shocked when they guess the wrong answer. The fact is there is practically no difference at all between Marxist communism and Democrat rule, and you need look no further than America’s inner cities, where Democrats have been the governing party for decades to see its effect. As though communism has not been tried enough (Soviet Union, all of eastern Europe, Cuba, Venezuela, North Korea, etc. ), the American Democrat Party continues to preach its tenets, appealing to the millions who are still stupid enough to believe in it. It is beyond shameful when half of the American electorate is so ignorant that a Democrat Party even exists.